I don’t know about you, but I’m fine with winter and cold weather up until Christmas. During the Christmas period I’m far to busy rushing around to notice the weather or the shortening days, but after the festive season has finished that’s when I start to feel the winter blues. January to April seem to be the hardest for me the temperature drops and so does my mood. Even for a happy person winter can work it’s gloomy magic and get them down, but there are ways to snap yourself out of that dreary mood and send the winter blues ‘a’ packing. It’s estimated that around 20% of people will suffer from the winter blues at one point or another during the winter season were they feel an Eb in their enthusiasm and feelings of Blah sets in, but winter’s not all that bad. For me the key to beating the seasonal blues is to keep my mind busy, a good distraction is a wonderful cure for the winter blues. If you suffer from serious depression, consult a doctor, but if you just need a short sharp kick in the pants there’s many ways to beat the winter blues at it’s own game and turn dark nights into bright days just by altering the way you feel about the colder season. Like most things in life it depends on how you look at the situation, even those grey clouds above you have a silver lining. Remember winter doesn’t last forever and summer’s warm embrace will be here before you know it, so sit back and choose which of the activities below will help you in surviving the winter blues. Cooking – It’s weird but when I think about winter the first thing I want to do is cook, I find it’s always a good idea to follow your instincts. I don’t know if it’s a primitive thing or romantic idea but fire and cooking is what gives me a comforting feeling about winter. Get cosy – Think cosy and immerse yourself in the reassuring feeling of being snug, whether that’s wearing woolly hats and fur lined boots on cold winter days, snuggling up on the sofa in a evening with your loved ones, reacquainting yourself with your favorite over sized jumper or curling up in front of a roaring fire. Whatever it is that makes you feel happy about winter embrace it. Crafting – Making something always cheers me up whether it’s knitting, making something for my garden next spring or revamping an old piece of furniture. Writing Fun – Journaling is a good way to pass some time and there are some great tutorials online, you could also try filling in a diary, writing poetry or finding some fun writing prompts on the Internet, but if your really feeling adventurous you could try writing your own book. Laughter – laughter is the best cure I know of when your feeling blue at anytime of the year, so watch a comedy, a funny TV show, phone a funny friend, go see a comedy show, or stay in and watch funny YouTube videos of cats, whatever makes you laugh go for it. Lively music – Knock it up a notch, fill your house with lively music. It’s guaranteed to put you in a good mood no matter what the weather is like outside. Wake up to your favorite tunes, have them blasting out while you cook, grab a hairbrush and air sing your heart out while you clean the house. Happy lively feel good music is a brilliant remedy for long dark nights. Socialize – Stay in contact with friends and family, join a local group or volunteer. The key is to talk whether it be your best friend or the greengrocer once a week, share a smile and connect with another human being. If you prefer a less intimate relationship with people then join a social media group online. Try to avoid arguments or negative emotions and sit and have a nice chat with someone. Indoor fun – Think of all the things you like to do indoors. Coffee with the girls or beer with the fellas, playing with the cat, reading a good book, playing board games, indoor picnics, pillow forts. Outdoors isn’t the only place you can have fun, indoors has it’s benefits too. Embrace Your Inner Child – Go out and buy yourself a pot of bubbles or play toy car smash ups. If your the type of person like me who loves to play, embrace your inner child and wile away the cold winter evenings with crazy science experiments, hop scotch in your living room or challenging your partner to “minute to win it” games. The Internet is full to bursting with ideas to keep kids happy and believe me they’ll keep you happy for a few evenings too if you open yourself up to the fun of being a kid again. Day Walks – It might seem implausible when your going through the winter blues but even in winter there is sunshine. Go outside for a walk during the day and enjoy the sun on your face, if the sun isn’t out then the good news is natural light helps your mood even on a cloudy day, so head outside during daylight hours for a walk. Exercise – exercising is a no brainier it makes you feel good and the best thing is you can do it indoors in the warm :-) It’s up to you whether you go to the gym, local swimming pool, play on the WII fit or exert yourself during an intimate moment with your partner (growl) :-). firing up your body releases endorphins into the blood stream and makes us feel good. Feed the birds – Looking after something that needs you can help distract you from negative self insulated thoughts, there are many birds and animals that need a little help to get them through the cold winter. As a bonus when you feed birds in your garden you get to sit by the window and enjoy them visiting your lawn or window box. Head out to a local pond to feed the ducks and geese or feed the wild rabbits in your area. Hobbies – adapt your hobbies or start a new one to starve the feelings of cabin fever. Photography, carpentry, DIY, knitting… the list is endless, be imaginative with the hobbies you already have, adapt them to the colder weather and bring them indoors. If you like golf you could set up a golf course in your home using cups to hit your ball into. Happy Memories – Look at photographs or video you took in the last 12 months. Recalling good memories makes us fell happy and helps in reminding us winter will be gone soon enough and there are more memories to make in the year ahead. 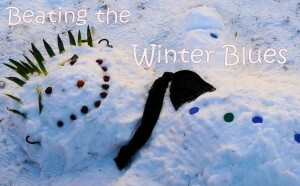 Fun Photography – Taking fun pictures of winter is a good way of seeing just how wonderful winter is. Everyone has a digital camera these days anyone can get a good shot and there are loads of ideas you can look up online for some fun photography projects for both indoors and out. Weekend Fun – Plan something fun for the weekend. It doesn’t have to be big or cost a load of money, it could be inviting your friends round for popcorn and a movie. Planning some weekend fun will distract you. You could every week come up with something fun to do and the winter blues will be the furthest from your mind. Blogging – Blogging takes up loads of time believe me. Your blog could be about yourself, hobbies, interests, fashion, shopping, DIY. Whatever rocks your boat share your enthusiasm with others online. Relax – Whether it’s meditation, massage, facial, listening to your favorite tunes, bubble bath or just chilling. Relaxing can recharge your batteries so give yourself some quality time. Winter is the perfect time to pamper yourself when there are no other distractions or places to be. Love the Season – Lets face it not everything about winter is bad, think about all the stuff only the joy of winter can bring. Building snow men, frosty mornings, winter walks, ice skating, going to a cosy pub, woolly hats, cold noses, deserted beaches all to yourself. Just like any other season winter has a charm of it’s own and has it’s own unique treasure to share with us that no other season can bring. Bright Colours – Change your hair colour to something bright, decorate a room with bright colours, buy yourself some bright flowers, buy a bright outfit, paint a bright picture. A splash of colour can help break a bad mood at any time of the year so think bright. Changing Rooms – Move your room around, changing the position of furniture in a room can help in making you feel better, it’s a cheap and affective way of changing the scenery. DIY – If you have the funds paint a room or remodel an old piece of furniture go around the house and fix all the little jobs you never got around to during the summer months or a project you’ve been meaning to get around to like tiling a kitchen to something a little more you. Winter Holiday – You could opt for a winter holiday to some where warm but who can afford that right, so instead go the whole hog and create a vacation in your living room. Just because it’s cold outside doesn’t mean it has be be dreary indoors. Inflate a paddling pool, whip up some cocktails, soundtrack of waves and seagulls in the background, beach balls, put on a bikini and play Bob Marley songs, awesome. Survival Kit – Winter is the season of colds and flu but even when we feel crappy there are things that make us feel better. Make a list of the things that make you feel better when your ill. It might seem strange but a cold and flu survival kit is a weird way of giving a positive spin on a bad situation. When I’m ill I like to snuggle down on the sofa in a warm blanket and watch old movies from my DVD collection or listen to the radio. I like to drink a sugary whiskey tea, wipe my nose with soft tissues and eat chicken soup. When I start to feel a bit better it’s puzzles, doodles and having a good book read to me by my hubby. What ever it is that makes you feel better collect them in a box or write a list so others will know what to do to get you through it. Yawn Buster – Some people find a light-box helps in making them feel less sleepy throughout the day and improves there mood, light-boxes stimulates natural sunlight making your body think it’s summer daylight hours when it’s dark outside. Moving your table or sofa near to a window can also help you get the most benefit from natural light as you work or sit in your living room. Vitamin D – Vitamin D is naturally produced in the body when we come into contact with sunlight, but because not much sunlight can penetrate the skin in winter due to the amount of clothes we have to wear to keep warm and limited opportunity of sunshine through weather conditions and shorter days, it means vitamin D levels are low in our bodies so it is suggested that taking vitamin D supplements can help the bodies vitamin D balance and might perk you up. Eating a Healthy Diet – Avoiding sugary and fatty food which can make you feel lethargic in the winter months, stodgy foods and over eating can make you feel sluggish and less active, eating foods that are lighter like salad and fruit are the best bet to put a spring in your step and stay ahead of winter.